I warned her… My sister, I mean. Sarah was always too interested in the Great Above and Abovers in general. I told her that you couldn’t trust those vicious creatures that hunt our waters with one hand and poison it with the another. A few tides ago we found an Above creature in our kelp garden. He thrashed about with his bubble machine tangled up in our frilly greens crop. We watched for a bit as he managed to damage and pull a large stalk from its rock. Sarah looked at my frantic face and back to the struggling Abover. “We have to get him out, he’s going to die and ruin our whole crop. If the council knows that an Abover touched the food this whole field will be destroyed.” She swam warily towards the black clad figure with her long red hair flowing behind, almost touching her fin tip. “Sarah! Be careful…” I shook in fear, not knowing what the Abover might do. As usual, he couldn’t see us but the minute she touched him her camouflage would be broken. Hesitantly, I approached and by that time Sarah had managed to get his large body untangled. I grabbed an arm and was amazed at how big around it was. Abovers are strange animals, so strong and cruel. I fought my fear and helped her slowly drag him to the surface. I was amazed at how much knowledge she already had about the weird beings. “Gross Sarah, don’t even say that!” I said with disgust, then stuck my tongue out at her. She laughed at my scrunched up expression. For a while we stayed quiet and just swam. I kept my eyes on the surface, anxious to get there quickly. I happened to look over at my sister and she was staring at the Abover’s masked face with a strange intensity. It made me uneasy and suddenly I wanted this bulky monster to die and go away. Just so he wouldn’t tempt Sarah further into something she would get hurt by. I knew that she would never let me harm him though, she’d always had a soft spot when it came to Abovers. Our father beat her once when he overheard Sarah say something nice about an Abover that untangled a turtle. She’s kept her opinions to herself since then, but I know my sister’s mind. She dreams of having legs and exploring the horrible suffocating dryness of land. It’s insane, I do realize. But I wouldn’t know how to stop her adventurous curiosity, even if I wanted too. A sharp gasp brought me out of my own head and back into the problem at hand. Sarah was wide eyed, looking into the clear mask that covered the Abover’s face, feeding him air. I peeked quickly and gasped also. “He’s awake!” I squeaked and dropped his arm. Sarah began struggling to pull him on her own, so I bit my lip and continued to help her. She smiled at me to say thank you for not swimming away. I frowned back. “Sarah, he’s looking at me.” I whispered to her. He then looked to Sarah. I quietly said, “I think we should just kill him, it’ll be much safer that way.” I wasn’t really sure why I was whispering, they were incapable of hearing our voices in the water, but it seemed safer to talk softly. “We’re almost to the surface anyway, then you may go back to being terrified and hating a species for no reason.” She put her nose in the air, using her haughtiness to make me feel stupid and small. She was good at that and learned it well from our mother. “There’s reasons…” I said with feeble defence and went silent. The Abover stayed limp and seemed to understand that we were saving him. He didn’t try to hurt either of us and looked at my sister and I as if we were magical beings. Which I suppose to him we would be. 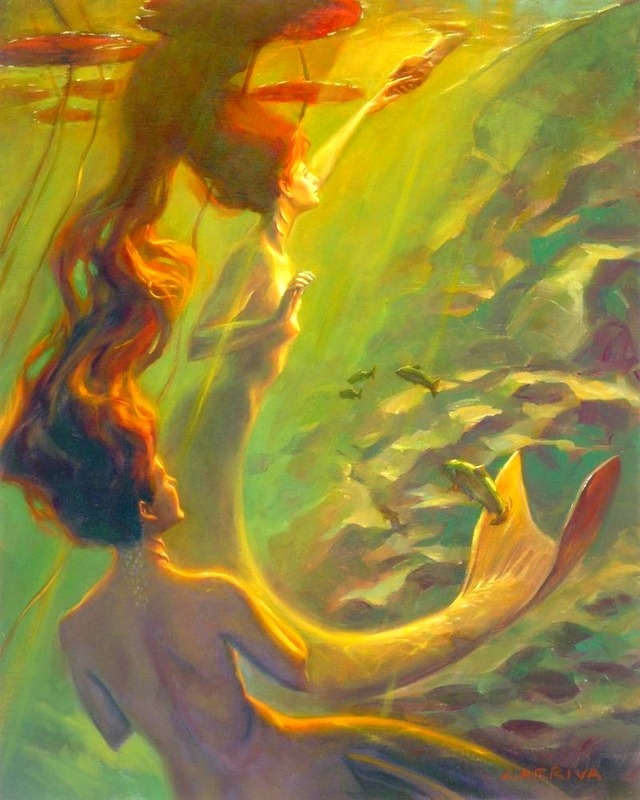 Merfolk as a race were thin and sleek with colorful scales where Abovers only had ugly hair covering their bodies. They seemed to hate their hairy bodies too because they usually had something covering their skin. We are beautiful and don’t see the need to hide in shame. Finally, we got to the surface and pushed the Abover up into the air. Immediately, he pulled the mask from his face and breathed as he should, now that he wasn’t underwater. “Fine, but just for a little while. Then we go.” I huffed and she grinned knowing she’d gotten her way, again. The Abover floated and got his breathing under control, but then put his face back into the water to look for us. We weren’t in contact with him so he was blind to our presence. But then ever-curious Sarah had to see his face up close, without the mask. She swam up to him, arms length from the searching creature. “Sarah, no!” I yelled, but she didn’t listen and it was too late. The Abover had happened to reach out and grazed her arm. He quickly wrapped his arms around her and didn’t want to let go even as she struggled to get away. “Cyril!” she cried out to me. I tried pulling her tail fin in an attempt to get her away from his grasp, but he was so incredibly strong. During the struggle, I realized that a boat was coming closer. Soon there would be more of them and I would never get my sister free. I let go of her, and sank my sharp nails into his leg. Pulling them both towards our home. We didn’t get far as a group before the Abover got desperate for air. I expected him to let go and swim up for air, but he refused to loosen his hold. He began to squeeze Sarah’s body tighter as he fought to get a breath. Sarah let out a terrible scream that chilled my heart. He released her suddenly, and went limp again. Out of air. I watched as his chest bucked in a feeble attempt to breath underwater. He would die and I was happy for it. He deserved to die. Then Sarah did the unthinkable. She put her mouth to his, sucked the ocean from his body and gave him air. “Sarah! What are you doing? Let him drown.” I shouted at her. She placed a hand over his mouth and nose to keep the air in, then started dragging him to the surface once more. What could I do? I helped. We didn’t go all the way to the top but by then there were other Abovers in the water searching for him. Invisible to them, we pushed the body into their arms and swam away quickly. They rushed to share the bottled air and get him safely in the boat. On the way back I caught Sarah with a hand to her lips, wonder in her eyes. Her expression scared me. “We’ve learned our lesson about getting close to the Abovers right?” I asked, to be sure she’d seen the experience as the near death that it was and not the beginning of something grand. Her absent nod of agreement scared me too. We made it back to the green fields and no one knew we had gone. No one knew of our terrible, amazing adventure and I found that I had to tell someone. I couldn’t keep this crazy happening rolling around inside my mind, so I’m writing. Maybe someday, I’ll let someone read it. Until then I will be at my sister’s side, keeping her safe from herself. I must. Even now I hear her calling out for someone and I know it’s him she’s searching for in her dreams. Yay! I liked this one! I think Kaysea is gonna love this too… hold up while I go tell her she has reading to do…. Lol she totally did! And shared it to her fb! I LOVE THIS STORY SO MUCH!!!!!!!! This is by far my favorite of all your stories, but then I am a sucker for mermaids. I seriously loved the modernness of it and helping the tangled diver. It’s a good thing he was lost from his dive buddy because it could have been even trickier for the ladies. I would love to see more to this tale.